The theatrical film based on Lego’s long-running ninja setting arrives on September 22, but we’ll be playing with the vehicles, dragons, and massive shark mechs starting in August. Check out five awesome new sets hitting stores in the coming months. In case you’re unfamiliar with Ninjago, go to a toy store or something. It’s one of Lego’s longest-running original properties. Just about everybody loves ninjas, and for those who don’t, the line also features pirates, high-tech vehicles, mystical creatures—it’s like an eight-year-old boy’s imagination threw up in the Lego aisle. It’s so good. The movie doesn’t look too shabby either. And it’s not just a funny trailer. It’s also a catalog of many of the new sets dropping on August 1. The five I’m sharing today aren’t as large and expensive as the $300 city set Io9 showed off yesterday, but combined they’ve got more than enough firepower to lay it to waste. Master Wu’s got a training boat, and it’s pretty massive. The Destiny’s Bounty features three modular rooms, four minifigures, a working anchor and plenty of secrets to uncover. Though I suppose if you’re building it, they won’t be very secret, will they? I mean, you’re pretty much going to know what’s under the roll-up panels here. The training room looks a little cramped, but ninjas make d0. Ninjas also make doo. I am sorry. It’s a whole lot of set for a nice chunk of change. 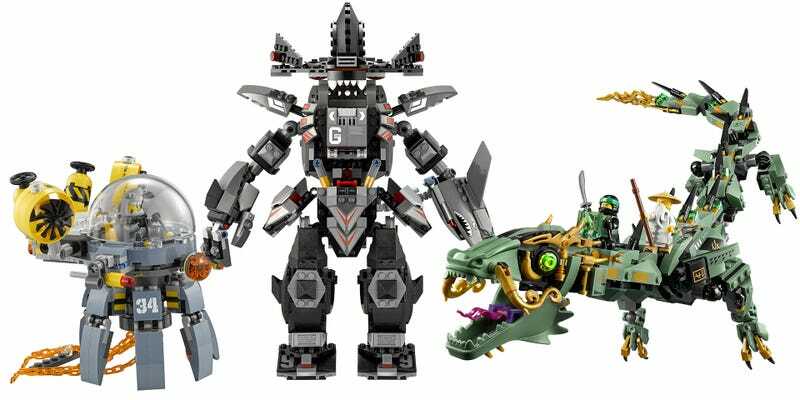 Ninjago always rocks the dragons, especially when they combine ancient designs with future tech. Also, Green Ninja Mech Dragon sounds like a Yu-Gi-Oh card. This monster looks to be super-flexible, which I am sure will come in handy as green ninja Lloyd (apparently pronounced L-Loyd) battles his evil dad. Speaking of which, evil dad’s four-armed minifigure is pretty cool. Going to need a bunch of him for fun mod possibilities. Those first two sets will be available all over the place on August 1. The rest are dreaded store exclusives. It’s Zane versus the Shark Soldiers, and Zane’s brought a tank. What’s the Shark Soldier brought? Hmm. Something tells me Zane is going to win this one. Now it just feels like Lego is trying way too hard. They had me at ninjas and dragons. Then they had to throw in a freaking shark mech. A shark mech with a missile-shooting shark for a hand. Walmart gets the cheapest exclusive, but also the cutest. Aww, little Shark Soldier piloting a little jelly fish. It’s adorable. I bet he is going to try and take on Zane’s tank. The Flying Jelly Sub comes with everything you see here. And there you have it, five pieces of high-tech ninja/demon/shark equipment you’ll be able to build in the privacy of your own home starting August 1. Go ninja. Go Ninjago.